It’s scientifically proven that humans use only 10-20% of their potential brain capacity on a daily basis. That’s 10-20% spent thinking about and processing daily events, chores, activities, interactions and relationships; analyzing, solving problems and dealing with whatever life throws at us. Imagine what that other 80-90% could do. Imagine where we could go as human beings, as intelligent creatures with the ability to take action, to change, do, build, move and create. That’s exactly what young activists growing up in Bali are doing: exploring their potential within the world to make a difference, to change things they noticed were not quite right. Through intelligent businesses, they have created solutions that not only aim to fix problems but to also spread awareness. The instigators of Bali-based businesses Bye Bye Plastic Bags, Nalu, and Kids Cut Conflict Palm Oil are all below the ripe old age of 16. Through their companies, they are taking action as children change the way things are unfolding environmentally, socially, and educationally. What has inspired them to do so? How have they achieved such levels of success? Dali Schonfelder, co-founder of clothing brand Nalu, describes the importance of teamwork and firm foundations in order to take action. 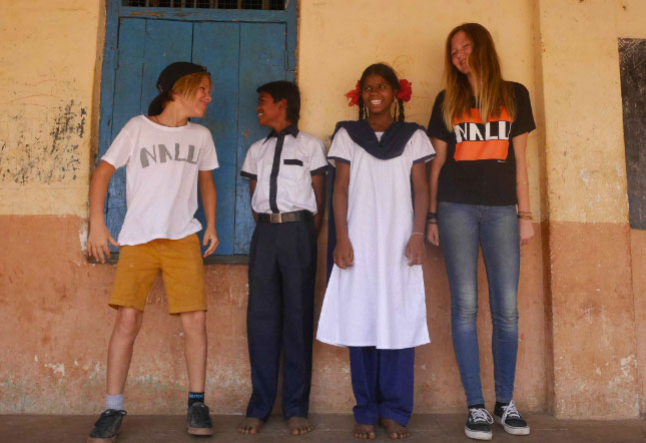 Together with her younger brother and support from her father, she has instigated and maintained Nalu’s success with a policy of ‘Get one, give one.” Through this, Nalu is able to provide school uniforms for underprivileged children in India. Nalu’s goal to "break the poverty cycle through education," has allowed them to access and experience societies beyond those of the normal day-to-day routine. Providing valuable insights for themselves, their peers, and for the children they are helping, Nalu helps individuals realize the value of accessing potential, and taking action in the face of adversity. In a similar story, Melati and Isabel Wijsen of Bye Bye Plastic Bags began a campaign to raise awareness of the worsening issue of pollution and plastic misuse in Bali. They set a goal to eliminate the use of all plastic bags on the island by 2018, and have already achieved an astonishing success rate. Since Bye Bye Plastic Bags' inception, they have given a TED talk at TED Global in London, travelled around the globe and enlisted the support of thousands in an online petition. Kids Cut Conflict Palm Oil is another group of enthusiastic young activists living in Bali who have taken an initiative to make a change. This organization is focused on eliminating the environmental impacts caused by pollution from farmers employed by palm oil companies who are illegally burning their waste. The exciting thing about these new business ventures is that their instigators are so young. Imagine what they will be doing in ten years time. Imagine the kids they will inspire to continue their work, investing time in ideas that start out small and nurturing them to grow into something beautiful. It is no coincidence that these new ideologies and stories stem from the same tiny island in Indonesia. Each of these young activists currently attends school in Bali and grew up surrounded by initiatives dedicated to the preservation of the environment and promotion of health, well-being, and more rounded, authentic lifestyles. Holistic and well-rounded education through initiatives like Green School Bali have provided these young people with the tools necessary to explore this potential, to generate a desire to take action, and the ideas with which to do so. Bali has proven to be a successful fertilizing ground for ventures such as these. We need people who are open to trying new things, exploring innovative ways of problem-solving to address issues that have been plaguing society for generations, and that will continue to shape our world and our future if we fail to address them. It’s inspiring to see these children taking matters into their own hands. Taking action in today’s world is vital if we are to create a better future for ourselves and generations to come.